NMM 9693. Chromatic harmonica by Hohner, Trossingen, 1936. In the early 1930's, Hohner introduced a 12-hole and, in 1936, a 16-hole chromatic harmonica that allows the performer to play a span of four full chromatic octaves. 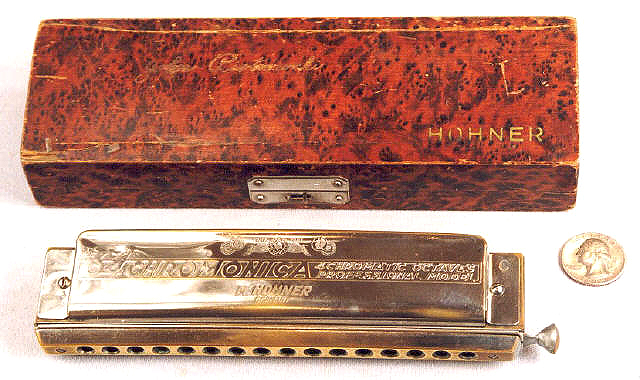 This is the very first version of the sixteen-hole harmonica and features the Hohner trademark displayed just above the "64 CHROMONICA" model name. Alan G. Bates Collection, 2000.